Lets apply the SMP system to schooling fish photography. 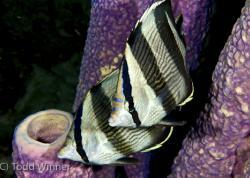 Also read our fish photography guide to learn how to photograph individual fish. Schooling fish in La Paz, Mexico. Get low, get close, don't scare the fish with your bubbles, have a wide lens on, and most importantly spend a lot of time with the school. Good schooling fish photos don't happen by accident. 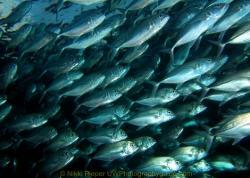 Schools of fish often frequent specific dive sites. You must first research the area you are diving and see where the schooling fish hang out. When I visited Bunaken, most people did not know that Barracuda live at Barracuda point, a long boat ride from most dive resorts. Only by requesting this trip and searching for the school was I able to get photographs of this school. 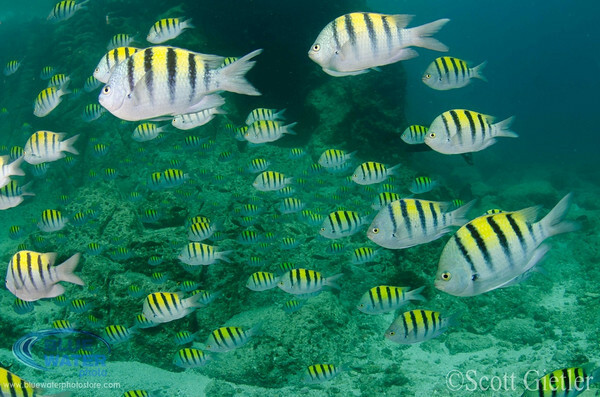 Once you know what types of schooling fish inhabit your dive area, Investigate what types of photos have been taken of these fish. Do they fall into a tornado formation? do they swirl? Are there predators moving through the school? Do they swim around a wreck? Pre-visualize the type of shots you want. Is your dive buddy in the shot? If so, you'll need to plan ahead how your dive buddy will get in the shot, without scaring away the fish. Discuss hand signals you will use, and how long your photo session will last. Lens selection is very important. A 10mm fisheye lens can capture an entire school. 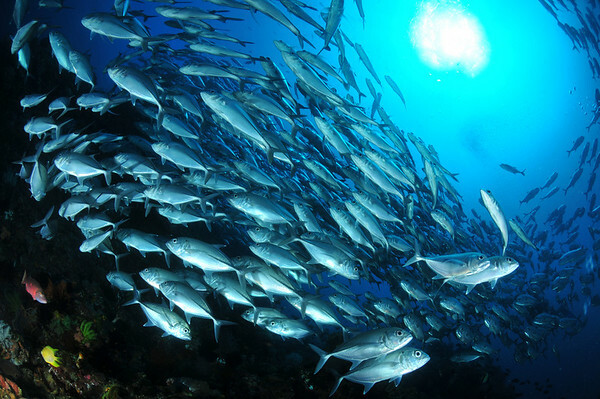 A 12-24mm or 17-70mm lens can capture a tight frame of selective members of the school, which is a good idea of the fish are large and/or colorful. 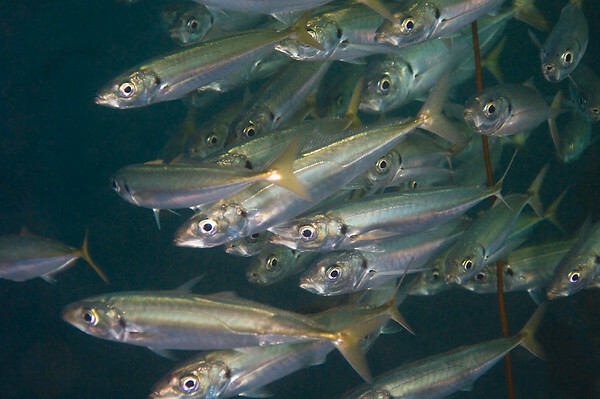 Small silvery fish in a polarized school will look better capturing the entire school with a fisheye lens. 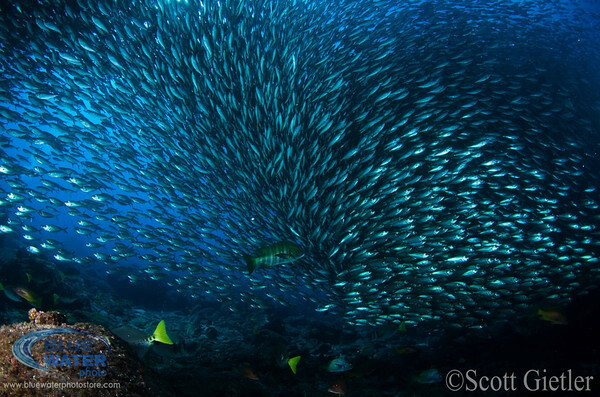 Become familiar with where you are most likely to find schooling fish. 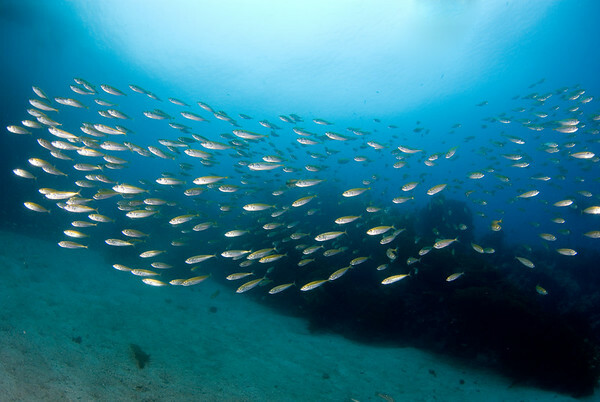 In many areas, schooling fish like shallow water, near the surface. Try doing an extended safety stop on some dives waiting for some fish to swim by. You will want to spend as long as possible with the school of fish to capture a special moment. It could be a certain formation, or it could be having the school of fish facing you. Having fish face you can be very difficult. you may have to control your breathing, since fish are usually scared of the sound of bubbles. Having your dive buddy drive the school towards you while you remain motionless is a good technique. Talk it out before hand. Bumphead parrotfish, tulamben, bali. F9, 1/320th, ISO 320, Tokina 10-17mm at 10mm. I was very close to these fish, I had to spend a good amount of time with them, learn their behavior, and wake up very early. When shooting schooling fish, in addition to capturing the right moment, I usually think about 6 things in striving to bring about the best possible presentation - composition, sunburst, diver in the photo, exposure, necessary shutter speed, & backscatter. Composition - Several compositions can be taken of fish. Here's a tip - try having a sunburst in the shot, diver in the middle, silhouettes, etc. 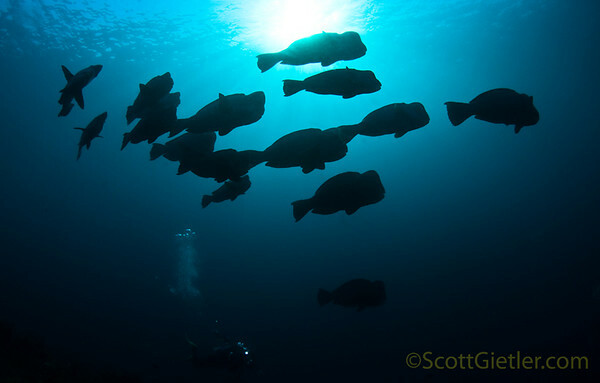 Silhouettes work for fish with a distinct shape, or schooling in a particular pattern. Try different compositions, taking care to include only what you want in the frame of the photo. Strive to get as close to the fish as possible. Diver in the photo - if you want a diver in the photo, be patient, wait for the right composition. Don't cut out their fins or legs out of the photo. Exposure - This can be tricky. if the fish are silvery, they will reflect light back. A low strobe power is needed. Take your strobes off TTL and put them on manual. If the fish are colorful and hard to get close to, you can try putting your strobes on full power. Use an aperture that is small enough for the depth of field you want, but large enough so your strobes are lighting up the fish properly, and giving your background enough ambient light. Shutter speed - make sure your shutter speed is sufficient to free their motion. Shoot a slow-moving school at 1/100th of a second. Adjust the speed as needed if they are moving faster (speed up your shutter speed for faster moving fish). Of course, if you want to go a creative route, shoot at a slow shutter speed to show motion. Make sure you lower your ISO and make your aperture smaller to avoid letting in too much ambient light when shooting at slower shutter speeds. 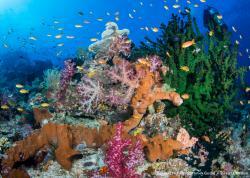 Read more about creative underwater photography. Backscatter - the lower the visibility, and the further away the fish are, the further out your strobes must be to reduce backscatter. Take lots of shots, and check your histogram often. Watch out for blown-out highlights. Remember, chasing schools of fish rarely works! I dove with these Jacks repeatedly until I got the conditions I wanted for some decent shots. Only after extensive research did I learn where this barracuda school hang out, and at what depths. If I hadn't requested the spot, we never would have seen this school. 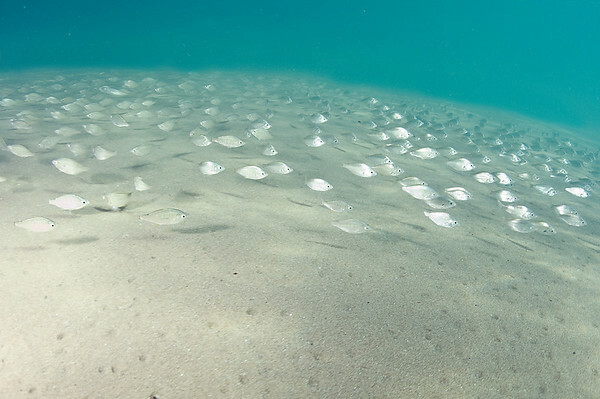 Spend time with a school of fish if possible and eventually they might swim towards you. 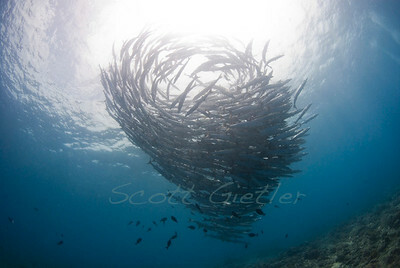 Sometimes you have to freedive to get close to a school of fish. I never could have taken this photograph on scuba gear. Bumping my ISO up to 400 allowed me to keep a good depth of field and also keep a fast shutter speed to freeze their movement. Schooling perch, Laguna Beach, CA. Nikon d300, tokina 10-17mm at 17mm. F9, 1/200th, ISO 400. Filling the frame with fish is not easy. I spent about 20 minutes with this school, before I could get close enough for this shot with my fisheye lens in La Paz, Baja. Submitted by sunni on Mon, 2010-04-19 02:03. Submitted by scottg on Tue, 2010-04-20 11:20.